Hip hop dialed down street violence in the Bronx. New Orleans’s Mardi Gras Indian gangs made peace through craft. Why is culture such an underrated civic tool? It’s not possible to write five words about the South Bronx without mentioning hip hop, given that is its birthplace. But recently, The American Prospect managed about 5,000 words without mentioning it once. It was a missed opportunity, because a peek into hip-hop’s nativity story would have challenged the “Bronx Cheer” narrative, written by Harold Meyerson, about the New York City borough’s slow climb out of abject poverty. The Bronx is not like the rest of urban America. Part of what makes it unique is the fact that it did resolve one of its most fundamental problems on its own. When gang violence reached peak levels in the 1970s, as a symptom of decades of racism and city-government neglect, Bronx youth came together and engineered a citywide gang truce. In December 1971, the gangs at the Hoe Avenue peace meeting decided that instead of fighting each other, they would compete through dance, graffiti, and fashion—a shift that basically midwifed the birth of hip-hop culture. This history is all captured in the recently released, Jim Carrey-produced documentary Rubble Kings, which features commentary from original members of the gangs involved in the peace talks. Among them are Afrika Bambaataa, the one-time “warlord” of the Black Spades, the largest gang in 1970s' NYC. Bambaataa changed the gang’s name to the Universal Zulu Nation, and its function to preserving hip-hop culture, which it still actively does today. Much of the drama involved in those talks became scenes in the cult-classic movie The Warriors. Like most urban areas, the Bronx has seen a huge decline in crime. In 1990, it was the site of 653 murders; in 2014, just 95. In the 41st police precinct, the notorious “Fort Apache,” murders declined from 44 in 1990 to 4 last year; in the adjoining 40th precinct in the South Bronx’s Mott Haven neighborhood, they went from 72 in 1990 to 7 last year. The Bronx is so much safer these days that there are plans to convert a former youth jail there into apartments. While street violence may not have been completely eradicated, it has dimmed considerably thanks to the kids who created hip hop. Yes, that meant sewing. Much like what Bambaataa did with the Black Spades, Montana led his gang, and other gangs, to battle through nonviolent, aesthetic competition. Specifically, Montana began the Indians’ cultural shift toward designing elaborate masks and costumes. 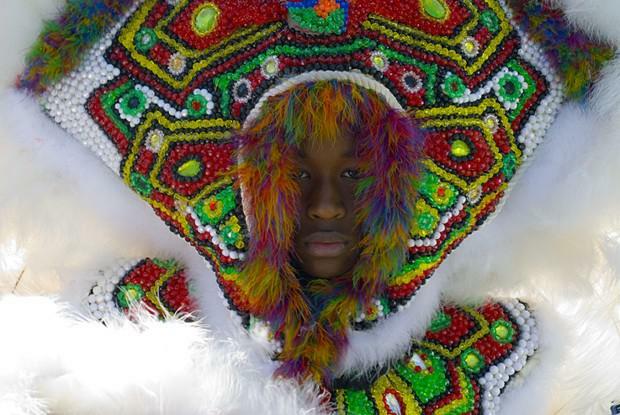 The tribes’ members spend months, sometimes years, creating these ornate outfits, which they wear and display during the city’s annual St. Joseph’s Day celebration and during Mardi Gras season. The black Mardi Gras Indian culture dates back to the late 19th century, when the gangs were formed, in part, to defend themselves from the White League, a gang of ex-Confederates in New Orleans who were hell-bent on terrorizing African Americans in the city. By the 21st century, the biggest threat of violence for the Mardi Gras Indians came from the police, who would regularly invade and break up their St. Joseph’s Day festivities. This politicized Montana, who began advocating against police brutality and for the rights of Mardi Gras Indians to march in the streets. Tragically, it was during a city hall meeting in June 2005 that Montana passed away following a heart attack—right after testifying about police harassment of the Indians before city council members and police top brass. New Orleans has more than its fair share of gun violence today, but things would likely be much more dangerous in certain communities if the Mardi Gras Indian gangs never transformed from brawlers to beaders. And it’s because of that legacy that many in the city are looking for productive ways to keep that culture enshrined in the civic landscape. As CityLab’s Kriston Capps reported in August, a council of Mardi Gras Indian leaders recently secured a $500,000 grant to build a cultural campus where people can learn the history and see how costumes are sewn. The Backstreet Museum in the fabled Treme neighborhood already provides some of that history, but its small size can’t quite capture the full scope and glory of the culture. It is a miniature space compared to the 178,000-square foot, $325 million World War II museum that sits in New Orleans’s Warehouse District. Meyerson was correct in pointing out in his American Prospect article that communities mired in poverty and crime need government intervention and investment to help raise them out of economic misery. The Bronx and New Orleans have demonstrated that their residents can organically develop armistice while enhancing quality of life for everyone at the same time. Both could use some of that World War II museum-scale financing to keep doing so.